Harvey Spawns Air Pollution Problems In Houston : Shots - Health News Flooding in Houston and utility outages led to belches of fumes from refineries and other industrial sites. Residents of a region already struggling with air pollution wonder: Is it safe to breathe? A smokestack rises in the background over the East Houston community of Manchester, Texas, where the air was heavy with what smelled like gasoline after Hurricane Harvey in late August. The neighborhood is ringed by industrial sites. On the first sunny day in Houston after about 50 inches of rain, residents in the east Houston community of Manchester emerged from their homes and gave thanks that their neighborhood had been spared in the floods. "Mama, yeah, I just feel blessed," said 73-year-old Maria Julia Rodriguez, standing in her driveway in late August and marveling at her luck. "God was looking out for us, I guess." And yet, something was wrong. The air was heavy with the smell of gasoline and other harder-to-place odors. 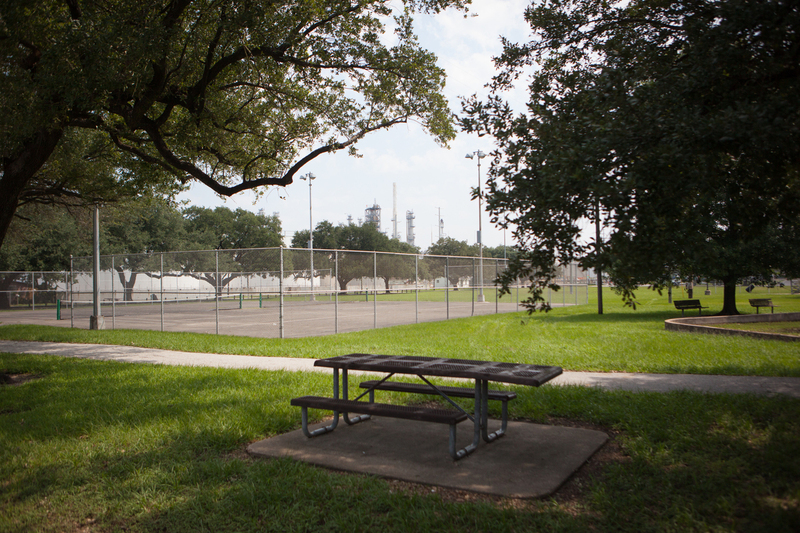 The neighborhood is ringed by industrial sites, the biggest of which is the Valero oil refinery, separated by fences from backyards and playgrounds. A lot of people in the neighborhood have lived there for decades, and say they're used to strange smells. Asked about a sickly sweet odor, Rodriguez said "that's how it always is here." But at least one person was alarmed by what they smelled. 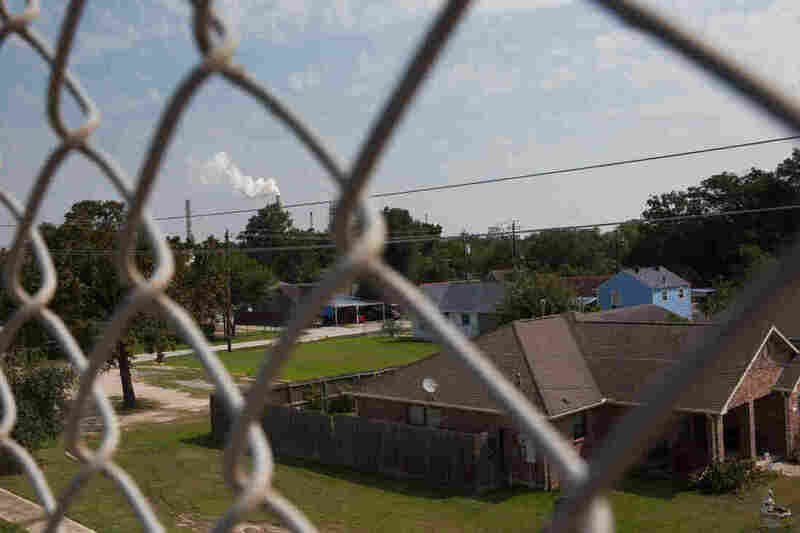 They called Houston's 311 hotline to report it, the city health department was alerted and about 24 hours later an air monitor measured a concentration of benzene so high that the CDC recommends workers exposed to that level of the chemical wear breathing protection. Benzene exposure can cause headaches and nausea. Long-term exposure increases the risk of cancer. The benzene plume in Manchester was one of dozens of unplanned air emissions caused by Harvey's flooding, some during the storm, others occurring for weeks after the rain stopped. Much of the public health focus in Houston has been on the hazards posed by flood waters, but the city is also facing a crisis in air quality. Even under normal circumstances, "air quality is a big problem in Houston," says Loren Raun, the chief scientist for the Houston Health Department. "We put out more emissions than any other city." At least 7 million pounds of pollutants have been emitted in and around Houston as a result of the storm so far, according to an analysis by the Environmental Defense Fund. 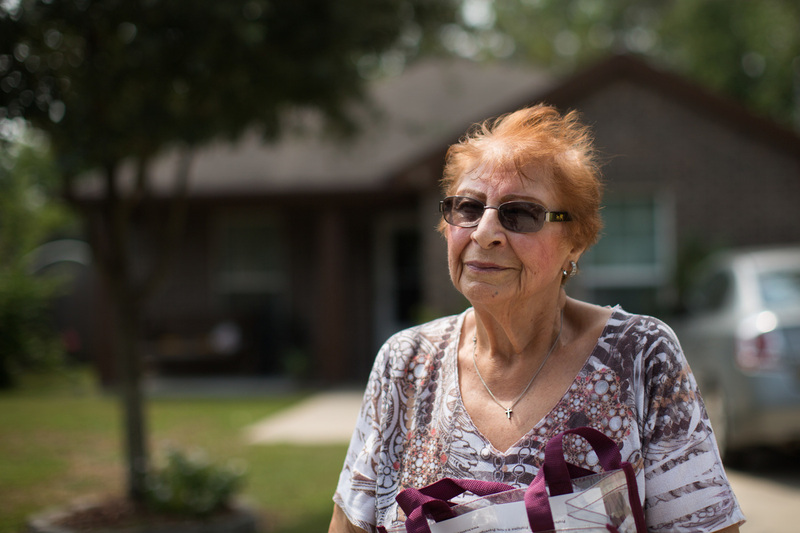 Maria Julia Rodriguez, 73, stands in her driveway in late August and marvels at her luck. "God was looking out for us, I guess." And there is more to come. Much of the pollution is the result of refineries shutting down and restarting, which releases petrochemicals into the air. The Environmental Defense Fund warns that about half the refineries in the region still are not operating at full capacity, and as they restart facilities, they'll release more pollution. Meanwhile, companies are still repairing acute damage from the storm, which caused additional emissions. A Dow Chemical site reported the facility that supplies its steam was hit by lightning during the storm. A chemical storage facility owned by Kinder Morgan reported a 10-day accidental release of 350 pounds of benzene, ethylbenzene, hexane, toluene and xylene, and another 9571 pounds of other volatile organic compounds. According to the city health department, the benzene in Manchester was caused by a leaking tank at the Valero refinery. Benzene is stored in tanks with so-called floating roofs that sit on top of the liquid chemical and move up and down according to the level of the liquid. They're considered safer, in many ways, than tanks with fixed roofs, because there is no air gap for volatile gasses. But the floating roofs are susceptible to flooding, because rain water can collect on top. When that happened to a Valero tank during Harvey, about 6.7 pounds of benzene leaked out and rapidly evaporated, according to a filing with the Texas Commission on Environmental Quality. The chain link fences between the tanks and people's homes did little to stop the plume from spreading. The company has not responded to NPR's inquiries about the status of cleanup or repair operations at the facility. As of Tuesday, Raun said the concentration of benzene in the air in Manchester had dropped to the point where she was no longer concerned about the immediate health risks. But, she cautioned, the overall air quality problem in the city "is ongoing," with high levels of ozone as well, which can exacerbate respiratory symptoms. "Those who are working outside, in the process of rebuilding, should be especially vigilant," says Elena Craft, a senior health scientist with the Environmental Defense Fund, an advocacy group. She says those who are most at risk, such as elderly people or people who already have respiratory diseases, need to be careful breathing outside air. Hartman Park in the Manchester neighborhood of Houston.The overall air quality problem in the city "is ongoing," with high levels of ozone as well, which can exacerbate respiratory symptoms. People who are most at risk, such as elderly people or people who already have respiratory diseases, need to be careful breathing outside air. One of the challenges for Houston officials right now is keeping up with air quality measurements. "We have the largest number of air quality monitors of any city," Raun notes, but many of them didn't operate during the storm, and were inaccessible for a week or more because of flooding. "After the storm, there was nothing, no information. The lab was ok," where they test samples, "but no one could move." The city's air monitors are all up and running again now, she says, and they're also using a mobile air monitoring unit – a trailer they can park in different neighborhoods to test for volatile organic chemicals, as well as ozone and particulate pollution. The EPA is also using a mobile air monitoring bus in southeast Houston, according to regional EPA spokesperson David Gray. The Texas Commission on Environmental Quality has not deployed its mobile air monitoring unit to the region. A TCEQ statement said both agencies had shut down some air monitoring stations to protect them from the storm, and that 96 percent of those in Houston were back online as of Monday, with 100 percent expected by the end of the week. "Of the available air monitoring data collected from Aug. 24 through Sept. 10, all measured concentrations were well below levels of health concern," Gray told Shots in an email. That period includes the time during which high benzene levels were measured in Manchester by independent air monitors. "We've seen lots of statements [saying things like] 'The air is perfectly fine; we haven't seen anything out of the ordinary with the monitoring units,' " says Craft. "I think that in some cases, they make assessments as to air quality prematurely." Craft's organization has partnered with a company in California that is testing the Houston air for volatile organic compounds including benzene, ethylbenzene toluene and xylene. Raun says her local health department can use all the help it can get with monitoring the air. "It's a huge area, and we're monitoring as much as we can, but we also rely on people reporting," she says. The agency has been running a public information campaign to encourage people to report strange smells, headaches, burning eyes or other symptoms that could be related to chemical exposure. "In neighborhoods where we're getting less reporting, it could be that there's less [pollution]," she says. "But it could also be that it smells like that every day, so why report it now?" Juan Parras, the executive director of Texas Environmental Justice Advocacy Services, or TEJAS, has been doing community organizing in low-income East Houston neighborhoods for more than 15 years. He says monitoring the air and being transparent about what pollutants are present is too little too late for people who are breathing polluted air. "We have had information about what they've been breathing in for years," Parras says, citing multiple studies showing carcinogens in the air, and elevated rates of cancer and respiratory illness in neighborhoods nestled among chemical plants and refineries. Juan Parras, left, the executive director of Texas Environmental Justice Advocacy Services, or TEJAS, talks with Kahler Stone and Jennifer Horney, part of a group from Texas A & M University who do soil and water testing in the Manchester neighborhood. "These are low-income communities, people of color — no one wants to pay for relocation," he says. Parras doesn't see that changing after Harvey, although he hopes it will. "We've been talking about this problem for 15 years. What makes me believe they'll do something this time?" "People need to understand, the area is not confined," Parras adds. "The pollution even moves into wealthy communities. They think they're not exposed, but they are."